Excellent choice of holiday for families or couples. Spacious, exceptionally well equipped villa. Very private with walled and landscaped gardens giving all year colour. Large sun terraces with beautiful patio furniture providing an excellent level of comfort. 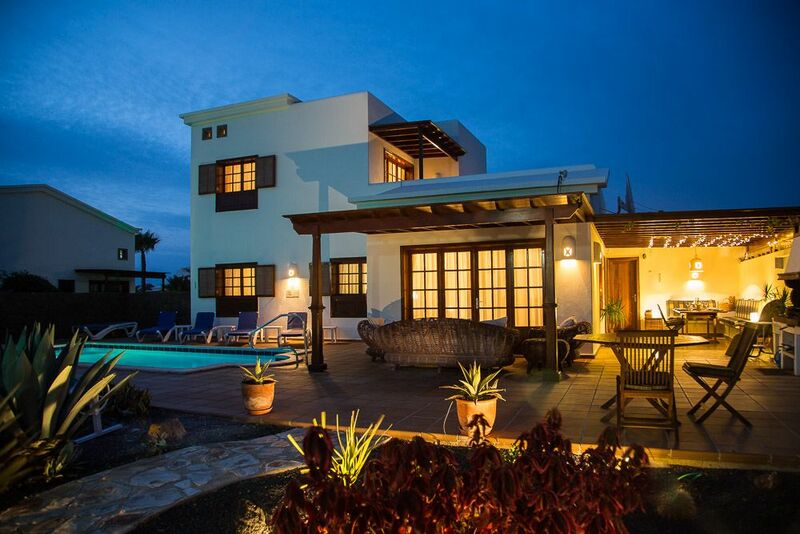 Superb panoramic views across to Fuerteventura and neighbouring islands. Comfortable alfresco dining area for up to 10 people where you can enjoy long lazy evenings over dinner. Many of our guests return time after time which is testament to the quality and privacy that you will find at our villa.Complimentary wifi is available for our guests! Two full sets of golf clubs are available for guest use on request-Free of charge. Two supermarkets and several restaurants are within 3 min walk - including 2 local bars that show all major sporting events on large TVs.The villa is located in a quiet residential area where our guests can enjoy a quiet, peaceful and relaxing holiday with dining and shopping a short stroll away. 2 BATHROOMS - En-suite, spacious, marble bathroom to bedroom 1 on first floor with bath and shower, wc and bidet. Also, marble bathroom on ground floor with bath/shower and wc. Lounge, 2 sofas, flat screen TV,300 channels, DVD and CD player. Selection of CDs & DVDs. Reading books and games. Patio doors lead to the covered pergola with very comfy, cane 3-piece-suite and table, perfect for reading or siesta on a warm lazy day. 20 minutes to the nearest golf course at Tias and a little further to the course at Costa Teguise. Two sets of golf clubs are available at the villa for guests' use (on request). Notes on accommodation: The villa has a safe. All bedroom windows are fitted with mosquito nets. Each bathroom has a hairdryer supplied. A number of circulation fans and heaters (seldom necessary) are supplied. The villa is also fitted with complimentary WiFi for guests' use. There are 2 full sets of golf clubs available (on request at time of booking) for sole use by our guests. Outside: Large walled, well stocked, very private gardens. On the large south facing terrace, 7 sunbeds and drinks tables around the electrically heated private swimming pool with safety hand rail, approx 8 by 4m. Wooden dining table and chairs, 2 lounger chairs, large stone BBQ, covered dining area with large teak table seats up to ten people, candles and or fairy lights. 3 Piece cane furniture suite with large comfortable cushions and 2 matching coffee tables. The large,totally private, upstairs terrace, with magnificent views across to the islands, has 2 sun loungers drinks tables and 2 lounger chairs plus a Bistro table with 4 folding chairs. There are a selection of inflatables and children's toys, buckets and spades, so you can relax from your 1st day while the children play. Utility Room: Washing machine, laundry basket, washing line, pegs, iron, ironing board, wall clothes airer and portable clothes airer. Cleaning / Towels / Linen / Maid service: The villa is cleaned on changeover days-additional cleans can be requested when booking.Top quality bedding and towels are changed weekly.Beach towels are provided for our guests.The pool is cleaned twice a week and is kept at a constant warm temperature. Other: Around the heated pool are 7 sunbeds and drinks tables.Large BBQ. Wooden table and chairs with cushions. Also on the terrace covered al fresco dining area with candles and or fairy lights with seating for up to 10 people. Everything about Villa Ruth was absolutely perfect . The welcome pack was such a lovely touch the simple things can make all the difference when you first arrive. Everything we needed was there for us to use we couldn’t think of anything more Fergus could of supplied . The villa was spotlessly clean plenty of towels for indoor and outdoor use .Beds and linen clean and very comfortable.. patio & pool area amazing so many places to sit and relax loved the heated pool which we made good use of everyday. Local shops bars and restaurants just 2 minute walk away we visited the Italian once which was really nice and the bakery several times for the wonderful cakes and fresh bread . Thank you Fergus for allowing us a later check out and for sharing your villa it really was one of the best we have stayed in we will be back . Excellent accommodation with personal touches. Beautifully kept gardens - everything was there for our needs. Kevin, thank you for your very positive review. All the beds were replaced in 2018 so I'm delighted with your comments. I'd be delighted to have you return anytime. Superb villa in an excellent location. We are frequent visitors to Faro park and villa Ruth is one of the best we have stayed in. We will definitely book this villa again and highly recommend it to others. We enjoyed our stay immensely and our two grandchildren loved the pool as they swam every day. We had everything we needed in the villa, from the pool toys to the welcoming foodpack and wine. So thoughtful and gratefully appreciated - home from home. Thank you for your very positive comments and I'm delighted that you had such a great holiday. I'm delighted to have many returning guests, year on year, and always strive to maintain a high level of service and a real 'home' for you to enjoy. It is a 5 minute stroll to the sea and the paved coastal promenade that leads to Playa Blanca. This walk offers wonderful views across the bay and the Islands of Los Lobos and Fuerteventura. Check out the beautiful sunsets. The nearest beach is 5 minutes drive away to Flamingo beach, ideal for children. There are other beaches close by including the wonderful Papagayo Beach and Dorada beach with pedalos and water sports. Arrecife airport is approximately 30 mins drive away (taxi -approx. 40 euros). Car hire is recommended to explore this beautiful Island. Taxis are available to get in and out of town. A punctual bus service is available from Faro Park to all the main areas of Playa Blanca for 1 Euro 20 cents - no matter where you are going on the route. These buses run from Faro Park promptly at 10 mins to and 20 mins past the hour. Local places of interest include Timanfaya National Park- spectacular landscape, plants and camel treks, Yaiza one of the most beautiful villages in Lanzarote, El Golfo famous for its volcanic crater, green lagoon and superb restaurants on the beach. Local shops, a fantastic bakery (fresh bread and wonderful cakes), deli, restaurants, coffee shop and bars are just 2 minutes walk from the villa. A short drive (3-4 minutes) gets you into the centre of Playa Blanca with a great choice of shops, bars and restaurants, many on the sea front. You can take the ferry here to visit Fuerteventura for the day. Just a short drive away is the new Rubicon Marina. Our villa information booklet contains lots of restaurant information and recommendations re places of interest on the island. Booking Notes: Reservations will be held for 7 days, a deposit of 50% is required to secure the booking.The balance is to be paid 8 weeks prior to arrival.All details about the villa and directions will be sent out upon final payment being received. Our villa is cleaned at time of changeover. However, should guests wish a 'mini clean' (bathrooms and floors) during their stay,this can be requested at time of booking.The cost of a mini clean is 25 Euros-payable direct to our villa managers at time of clean. Changeover Day: The villa will be available for use by 2pm on arrival day and please vacate by 10am on departure day. Depending on villa bookings, these times can be negotiable. Flexible re changeover days. Notes on prices: Prices are for the property per week in UK Pounds. The price is based on up to 4 people sharing - depending on season. Extra persons at £60 per person per week - depending on season. Children under 3 years stay free - A Cot and High Chair are available at the villa (free of charge). A welcome pack with wine is provided on arrival. Beach towels are supplied for our guests use at no extra cost.